Synopsis: A young boy lies awake in his room one snowy Christmas Eve, excited and alert. Breathing silently. Hardly moving. Waiting. He's listening for a sound he's afraid that he might never hear--the ringing bells of Santa's sleigh. The time is five minutes to midnight. Suddenly, a thunderous roar startles the boy. 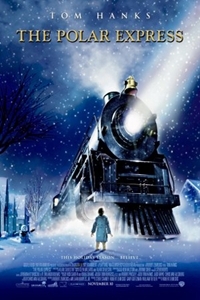 Clearing the mist from his window he sees the most amazing sight--a gleaming black train rumbles to a stop right in front of his house, the steam from its powerful engine hissing through the night sky and the softly falling snowflakes. The boy rushes outside, clad only in his pajamas and slippers, and is met by the train's conductor who seems to be waiting just for him. "Well, are you coming?" the conductor inquires. "Where?" the boy asks. "Why, to the North Pole--of course. This is the Polar Express!" What unfolds is an adventure that follows a doubting young boy, who takes an extraordinary train ride to the North Pole; during this ride, he embarks on a journey of self-discovery that shows him that the wonder of life never fades for those who believe.